Rick Beinhauer never set out to find a prospective extender of the Axworthy sire line when he purchased Sierra Kosmos at the 1990 Adios Yearling Sale. The vast majority of contemporary trotters descend from the Peter The Great paternal line, although this was not always so. Early rival families started by Bingen and McKinney were overtaken by Axworthy and Peter The Great in the 20th century, and the Axworthys had the edge at first. The first three Hambletonian winners–Guy McKinney, filly Iosola’s Worthy, and Spencer–were all paternal descendants of Axworthy, as was the legendary Greyhound. Little by little, the Peter The Great sires took command through the influence of Star’s Pride, Speedy Crown, Noble Victory, Garland Lobell, and their male offspring. 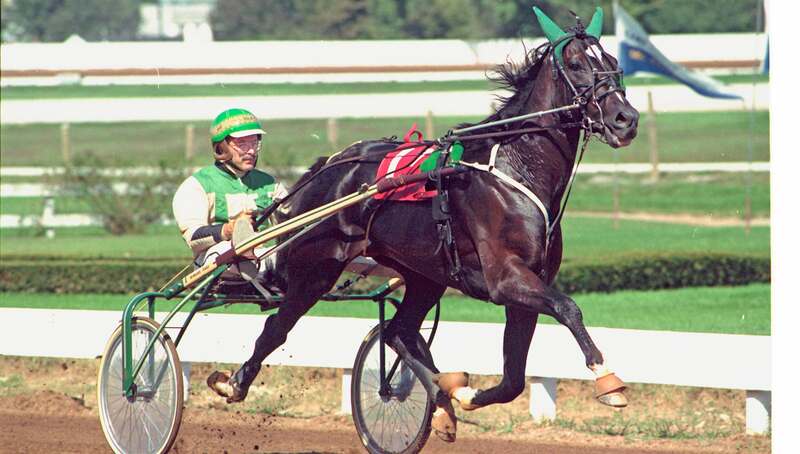 As the yearling Sierra Kosmos progressed for his owner/trainer/driver in 1990, Beinhauer became aware that his horse might offer outcross gold one day. Sierra Kosmos was a tail male Axworthy-line colt with all the ingredients for success at the sport’s highest level. “We started to look into it more, and you could see the potential,” he said. Sierra Kosmos was tall and long-legged as a yearling, and didn’t resemble many of his peers, noted his Pennsylvania-based owner. Sierra Kosmos 2, 1:56.4 – 1.58.1f; 3, 1:53.4 – 1:56.3h ($558,710) displayed the refined phenotype, or physical characteristics, of Axworthy himself. The “old-style trotter” took to his early lessons flawlessly. Beinhauer, now 71, sensed the $7,500 colt’s unexpected athleticism after jogging him for only a week or so. He remembered the excitement of telling his father. Sierra Kosmos possessed raw speed, an asset often found lacking in Axworthy-line trotters. Nonetheless, the friendly colt became manageable for the duration of his two-year racing career, with racetrack misbehavior sometimes brought about by an unusual sensitivity to his surroundings. “About the only time Sierra Kosmos ever got beat in a race was when he made a break at the gate,” said Beinhauer, who was also his regular driver. Although Sierra Kosmos was gentle and intelligent—Beinhauer’s wife, Regina, said the couple did everything but invite the sweet-natured stallion into their home each night—he required careful handling to maintain his mental “A” game on the racetrack. Special permission to train Sierra Kosmos during afternoons at The Meadows was granted by race secretary Tom Leasure. According to Beinhauer, the most important aspect of training Sierra Kosmos was making sure that he stayed calm on the racetrack. At age 2, Sierra Kosmos was an eight-time winner from 14 starts. The colt triumphed in the Arden Downs Stakes, Reynolds Stakes, Harriman Cup, Horseman Stakes, and Pennsylvania Sire Stakes at The Meadows. He was first in seven of 16 starts at age 3, although breaks happened at some unfortunate moments. 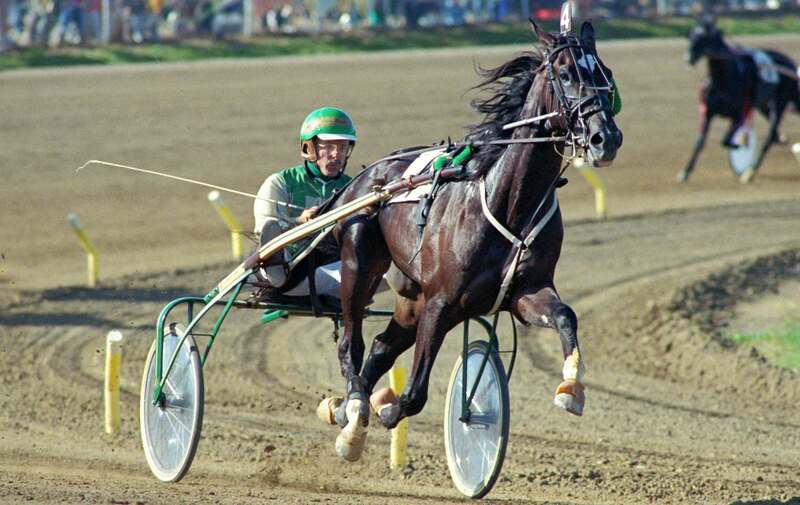 After a momentary lapse at the start of the 1992 World Trotting Derby’s first heat, Sierra Kosmos reset but ended up fifth behind victorious filly Imperfection. In the second heat, Sierra Kosmos and Imperfection stormed past fading leader Alf Palema in the stretch, with Beinhauer’s trotter besting the Mike Lachance-reined filly in 1:54.3. In the same-day deciding heat at the Du Quoin State Fairgrounds, wagering favorite Sierra Kosmos made another miscue leaving, chasing down but never catching winner Alf Palema and place-finisher Imperfection in the 1:57.1 mile. The Nearly Perfect son redeemed himself in his next start. 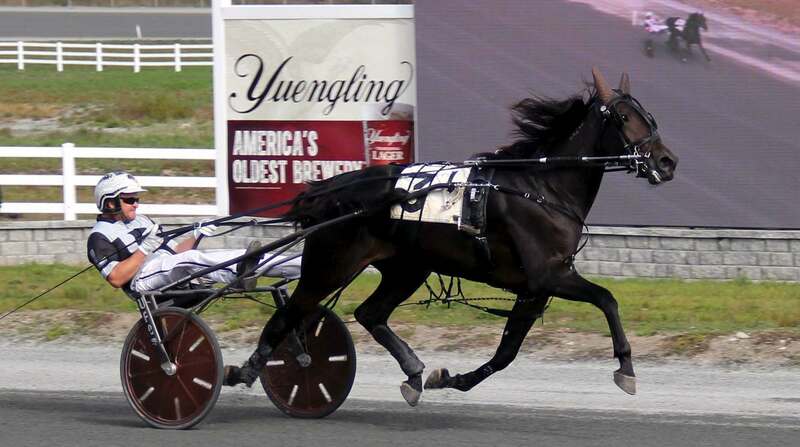 He set a world record of 1:56.3h in winning the Old Oaken Bucket at the Delaware County Fairgrounds, crossing the wire a stunning 14-1/2 lengths ahead of place-finisher Tarport Mark. In what would be his final race, Sierra Kosmos felled a field of eight competitors at Red Mile, in the Transylvania Stakes’ first heat. His 1:53.4 clocking established the season’s best record for sophomore trotters. Sierra Kosmos was subsequently scratched from the same-day final, but not for the “lameness” listed on the official record, said Beinhauer. 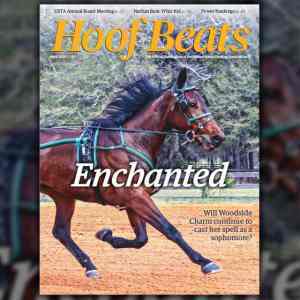 “The reason that happened is we had already been in talks with Hanover Shoe Farms,” he explained. “That was the only reason.” Sierra Kosmos was to end his racing career on an undeniable summit, “from a stallion perspective.” Beinhauer, who had travelled the country with his wife and parents to campaign the colt, chose to retire and syndicate Sierra Kosmos to assist his father, who was unwell at the time. The striking colt developed into a stallion Beinhauer longed to bring back to the track. Sierra Kosmos “filled out and muscled up” during stud duty at Hanover, remaining gentlemanly even when prancing on the lead shank en route to breeding duties. No Nonsense Woman, a daughter of Sierra Kosmos, earned over $1.2 million in her career. Other notables included Hambletonian Oaks winner Fern 2, 2:02.4f; 3, 1:54.4; 4, 1:52.3 ($1,245,502); Beinhauer’s own Springtop 3, 1:57.4f; 1:53.1s ($1,209,078); World Trotting Derby champion Kick Tail 3, 1:54.2; 4, 1:53.3 ($730,482); and Hambletonian elimination winner Silver Pine 2, 2:00.1; 3, 1:54.1 ($373,663). From 1993 to 2014, Sierra Kosmos sired 1,137 foals, never generating that elusive male successor who would carry the Axworthy mantle forward with any certainty. His best hope for extending the male line may have been with Silver Pine, who was exported in 1998 and approved to stand in Sweden. Before his death in 2015, he sired 530 offspring there, the collective winners of 63,094,554 krona. While Sierra Kosmos is now a beloved pet at the Beinhauers’ Pennsylvania farm, relaxing in a paddock where he can quietly watch day-to-day barn activities, he never quite escaped his reputation. The fit 29-year-old stallion had an on-track temperament that required the careful management of an old-school horseman willing and able to invest the one-on-one attention. By pure coincidence, the best of Sierra Kosmos’ final crop is trained by Beinhauer’s winter barn neighbor in Spring Garden Ranch, Fla.
George Ducharme said he was genuinely startled when he initially learned that Sierra Kosmos, the sire of Bag O Chips 2, 1:57.3f ($93,100), had officially retired from stud in 2015, after spending his last breeding seasons at Pennsylvania’s Lindwood Farm. Ducharme said Bag O Chips carried some traits inherent in sons and daughters of Sierra Kosmos. Last season, Bag O Chips was in complete control of the 2-year-old filly division in Massachusetts, bringing home top honors in the division on the basis of her undefeated status at Plainridge Park. In November, she went wire-to-wire for driver Chris Lems in the $90,000 Massachusetts Sire Stakes final, winning in 1:58.2. The filly’s trainer was going to assess Bag O Chips’ sophomore campaign prospects in early 2018. “Hopefully she can be a [Pennsylvania] Stallion Series horse, and maybe we’ll pay her up to a couple late closers or something and see where she fits, but for the most part, it’s just a couple Pennsylvania races if she’s good enough and get ready for Massachusetts again,” said Ducharme.